Schools of vermillion snapper are usually found on deeper reefs and rocky bottom from 250-400 feet of water. "Deep dropping" with chicken rigs is the primary technique for boating these snapper. The most important part of vermillion snapper fishing is having a good bottom machine.. Usually a 1kw transducer will do but we have a 3kw chirp transducer so we can practically count them. While using the bottom lock setting (zoom) look for rock piles or other forms of structure in the correct death. After marking an area that looks promising, we send 20-40 pound class rods and reels with multiple hooks straight to the bottom. The great thing about vermillion snapper fishing is that you can catch a lot of snapper quickly without anchoring. This means we can kite fish for big game fish and troll during half days but still put some snapper in the box with under 20 minutes of fishing most of the time. The technique is very simple for the angler which involves sending the bait to the bottom and getting bit instantly at most of our spots. 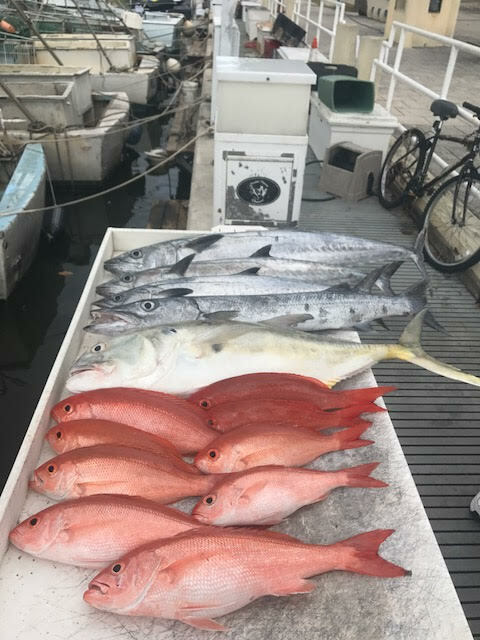 The only difficulty is usually predators such as amberjack, barracuda, and sharks that also want the snapper we're catching. Snapper fishing is fun and vermillions are absolutely delicious. These fish need to be a minimum 12" in length and are great in the oven cooked whole.